It is imperative that we recognize our lifestyle and eating habits pollute our temple, break down our immune system and cause us to be sick. Sickness is simply the body reacting to us putting something into it that God did not intend or design for it to have. Until steps are taken to recognize and remove the cause of disease and suffering, only degeneration an early death will result. Bible puts it this way and we must learn “be not deceived, God is not mocked, for whatsoever a man soweth that shall he reap” Galatians 6:7. We cannot eat the diet of this world and enjoy perfect health and vitality. The choices we make determine whether we live in sickness or health. If we choose to have abundant life, it will be necessary to change the diet and lifestyle to which we have been accustomed or addicted. Although it initially may sound difficult and restrictive to obtain optimal health it is the only choice we have. Our heavenly father set laws for our infinite good to preserve life and allow his children to attain their highest possible state of wellness. He made no boundaries on what we may attend, but our diet and lifestyle choices often limit us when we knowingly or unknowingly violate his natural laws. When we bring our lifestyle into alignment with God’s laws, most physical problems just simply begin to be washed away. 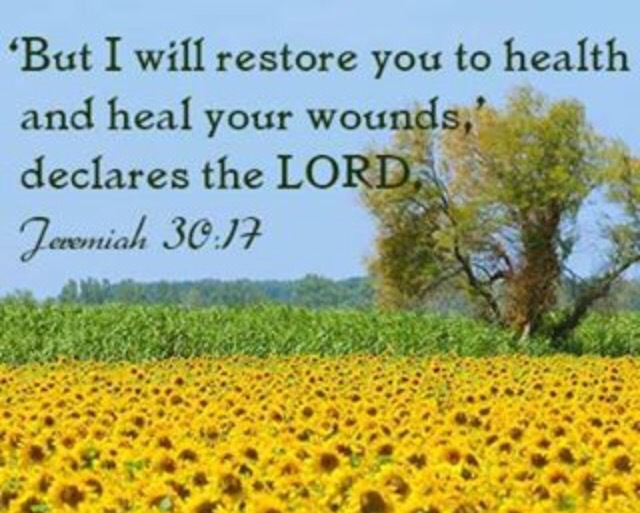 Yes, God wants his children to be well, and he is able to heal our broken bodies just like when he walked among us. However, we are called to be reverent of his natural laws! When natural laws are violated, we reap the consequences of our actions. Many Christians want to live the way they like, eat what they want, and then they get sick and some blame and question Him. But God very clearly warns us and calls us to reject worldly was the flesh and driving selfish nature of want and need placed in us by sin. As we humble ourselves and become obedient to our creator and the natural and physical laws he established, we will realize that it is a privilege and indeed an honor to serve God and honor his Holy temple. The sad and unfortunate truth is as a people we have adulterated and negatively impacted every single one of these required sources for life. There is no longer any pure source of nutrition due to pesticides and soil nutrient depletion we have adulterated our food source with GMO’s. Our air is laden with toxic irritants and our bodies are under constant attack. There is no longer a pure source of water on our planet. And our lifestyles are that of sedentary complacency. Often with attitudes of blame and Great lack of responsibility. If we believe he created us than we realize the reality is that someone designed and created us. And if someone designed and created us we have just like a vehicle requirements to maintain our optimal performance. They cannot run on just anything and remain functioning at top capacity and capability. If we don’t change our oil for example eventually our vehicle will fall into disrepair and stop working We in our ignorance and unbelief, have totally changed and adulterated gods plan, and the result is sickness, disease and unhappiness. We can’t serve the Lord in a sick body, so it is time to take responsibility for our own bodies and health and not leave it up to anyone else or blame other people or outside causes for our declining state. God has not failed us. He is the same yesterday today and forever. We my friends are the ones who have gone astray. I invite you to truly meditate upon this. Digging to his word and ask him what he has for you to do in this area. Have you ever wondered why a certain diet worked for your best friend, but not for you? Or why one twin develops Type II diabetes, but the other twin doesn’t? The answer is highly personal—it’s in your DNA and the lifestyle choices you make. We grow up hearing about how unique each of us is, but we often forget that our uniqueness goes down to the cellular level. It’s the reason why someone like comedian George Burns can live to be 100, even with a notable smoking habit, while other people die of lung cancer in their 40s. Modern Science has made tremendous advances in understanding human DNA, and now we’re able to easily use genetic research to our advantage, especially when it comes to our diet. A few years, even months ago the though of allowing another “scientific” approach to influence my health whatsoever would have sent me SCREAMING for the hills. But then I had to sit with that for a minute (or months LOL) Has it n to been my prayer that the medical and holistic community would find some middle ground and begin working together? Epigenome means the network of chemical compounds that interacts with the genome by directing which genetic material to activate or which to leave inactive—the mechanism that “turns on” or “turns off” your DNA. The epigenome is affected by personal health, diet, nutrition, exercise, and other lifestyle choices—think “written in pencil”—thus affecting which genetic material is active. Nutrigenomics is a field that combines the study of nutrition and gene expression. Scientists working in this field investigate how nutrients and other bioactive components in food affect important metabolic and physiological processes by “turning on” or “turning off” certain genes. Turning genes on and off? It may sound to good to be true, but it’s very real. Nutrigenomics has come a long way in a short time and has developed a wealth of information that can be used by anyone concerned about personalizing and truly understanding their healthcare plan. Dr. Ahmed El-Sohemy, one of the top researchers in the nutrigenomics field, investigates how the foods we eat interact with our genes to affect our health. in one paper he reports. Compounds found in broccoli can switch on a gene that helps the body detoxify some of the chemicals we’re exposed to every day. This gene is missing in about 20% of the general population who won’t get the detoxification benefits (though they will still get the other benefits of healthy eating). In some people, creatine supplementation provides large increases in performance and increases lean mass. In others with different DNA, there is no response at all. Studies with caffeinated coffee show that for some individuals, drinking coffee lowers the risk of heart attacks. But in other individuals, the same dose of coffee actually increases the risk of heart attacks. The new science of nutrigenomics teaches us what specific foods tell your genes. What you eat directly determines the genetic messages your body receives. These messages, in turn, control all the molecules that constitute your metabolism: the molecules that tell your body to burn calories or store them. If you can learn the language of your genes and control the messages and instructions they give your body and your metabolism, you can radically alter how food interacts with your body, lose weight, and optimize your health. The implications of this research are huge. It determines, for example, why certain medications work for some people, but not for others, or why people need different doses of medication. And while studies often show inconsistencies about how nutrients, supplements, and other bioactives work in the body, everything depends on the DNA of the subjects being studied. This has lead me to ponder then how effective supplementation is? I have always been a huge advocate for it! It fact our home prioritizes or small budget to ensuring we all have proper supplementation even on our very modest income. But maybe a better approach would be for science and holistic health to work hand in hand to discover how we can eat to support our specific body activation. Encouraging it to carry out the tasks it was designed for. But not functioning at highest capacity due to the negative impact our lifestyle has had on our environment, food and water supply as well as heal care system and wellness education. No longer guessing what we need and providing supplements based on symptoms (a body does not even exhibit symptoms unless that system is functioning at less than 60%). But truly understanding and respecting our unique and wicked temples and the care they require! So many of us go through our lives without ever truly understanding how what we eat effects our overall health and wellness. We never consider to suspect that the foods we do or don’t eat every day are the source of this decades sate of health. The amount of food sensitives that go ignored and misunderstood are in my opinion a epidemic. Most of us go through our lives living with symptoms we’ve had for so long our brains have just literally learned to suppress them but unfortunately our bodies themselves do not really have that choice. What happens is simply a domino where one thing continues to cascade into another. All creeping on so slowly that for myself personally I had no clue, I truly had been feeling so horribly until I began to heal. Functioning in this space of cyclical depression and defeat. But sort making the best of it? 🙂 Until we get our heads out of the sand and recognize our uniqueness we are not going to learn grow and succeed. What we put in our bodies is the source of all disease a predisposition dose not guarantee disease unless we activate it. And this activation or symptom is going to look different in each of us depending on our gene makeup. But the source is the same, your NUTRITION or lack they of. I am a woman very strong in my Faith and the more I read his word and understand him the better I can understand myself and my temple. As I begin to truly comprehend his crazy love for us leads me to believe he would never live us hear without everything we ever needed right from day one here on this earth. Understanding this leads we to see and accept the concept of what a interconnected fantastic eco system he has created not only around us but in us! And just like the delicate eco system of the animals our way of life is rendering extinct. We to can be throw completely off by a simple imbalance that sets off a chain reaction within us. Once we as a people are able to understand hoe truly wholly and uniquely our bodies function. We will be able to truly support true healing and overall general simple health and wellness my living as GOD calls us to be. Respectful stewards of HIS temple for we are the dwelling place of his holly spirit.